Located 7 miles from Ely Minnesota , Moose Track Adventures is a Boundary Waters Outfitter on the edge of the Boundary Waters Canoe Area Wilderness. We are a full service Boundary Waters Canoe Area outfitter and Quetico canoe trip outfitter and provide our customers ONLY the BEST AVAILABLE Boundary Waters canoe rental & outfitting gear on the market. We have been guiding and outfitting BWCA wilderness canoe trips in the Boundary Waters Canoe Area and Quetico for over 20 years and consider the Boundary Waters Canoe Area our backyard. We provide you with the best canoe outfitting gear available and not to mention great food and expert trip routing. Whether you are interested in complete or partial outfitting for your Boundary Waters or Quetico canoe trip, we are positive we can customize a trip for you. Boundary Waters Camping Menu – with Fresh Food! Minimum of 2 people per trip. Solo trip is possible but will be more because food is pre-packed ‘for 2 people’. Your Equipment Responsibilities: You are financially responsible for any damage or loss of equipment rented from Moose Track Adventures during your trip and will be charged accordingly for repair or replacement of the item. Cook Kits MUST be returned CLEAN or an additional $25 will be charged. Renter will be shown the equipment prior to use and it will be examined at the end of use. Renter will sign & agrees to be responsible for and promptly pay for any damage to the equipment caused during the rental period. We do require a credit card at the time of signing the rental agreement for damage deposit. Final Payment: Payment in full is required upon check-in. We accept MasterCard, Visa, money orders, travelers checks and cash. We will accept personal checks only if received within 30 days before the date of reservation. Cancellations: In the event of a cancellation of reservation, deposit fees are nonrefundable. 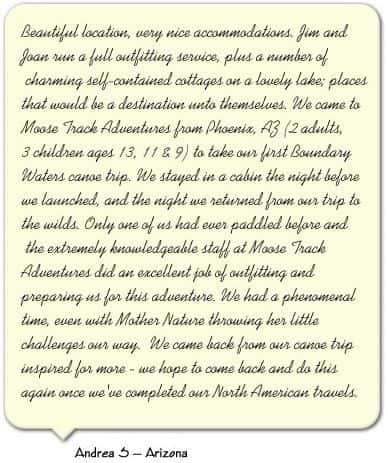 The deposits (minus permit, camping fees and $35 service fee) will be applied towards a future trip with Moose Track Adventures during this season or next year. Refunds: There are no refunds for complete or partial outfitting trips that end early, for equipment returned early, or for any unused food, transportation or accommodations that were reserved.